Kimchi is a Korean side dish. This traditional meal is most of the times made using napa cabbage and radishes, seasonings like ginger, garlic or chili powder and salted seafood. The key feature of this dish is that the vegetables have to ferment before being served. 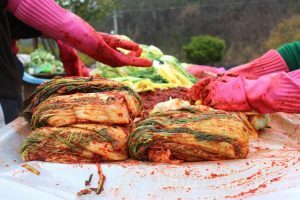 Because there are a lot of vegetables which can ferment, there are, consequently, a lot of versions of kimchi, each with its own combination of ingredients. This dish is placed to ferment inside a refrigerator, which is also the place used to store it. Before refrigerators existed, kimchi was traditionally kept in jars somewhere underground in order to stay cool in summer and unfrozen during winter. Take the cabbage and cut it along its length into 4 equal pieces. Cut away the cores from each quarter. Further cut each piece crosswise into strips that are 2 inches wide. Put the napa cabbage in the bowl and pour some salt over it. Using your fingers, massage the leaves, until the salt makes them soft and moist. Pour water into the bowl until it covers the cabbage. Place a plate over the cabbage and keep it pressed down with a weight for 60 to 120 minutes. Rinse the napa cabbage with cold water a few times, then place it in a colander for 15 to 20 minutes to drain. While the cabbage is draining proceed with the spice paste. Wash and wipe the bowl in which the cabbage was salted. Add together the garlic, the ginger, sugar, and the fish sauce or water and mix them into a homogenous paste. Stir in the red pepper flakes, using from 1 tablespoon for mild up to 5 tablespoons for very spicy. Mix the vegetables with the spice paste. Take the cabbage and gently squeeze out any remaining water. After that, mix it with the spice paste. Also, add the scallions and radish. Using your fingers, carefully mix the paste with the vegetables so they become coated on all sides. If you want to keep your hands clean, this is the part where you use the gloves. Press the kimchi composition into the 1-quart jar. Push down on it so that all the vegetables are submerged under the brine. Leave about 1 inch of space between the brine level and the top of the jar then seal it with the lid. Put the jar over a bowl or a plate to help catch any overflow. Place the jar at room temperature, away from direct sunlight for 1 to 5 days in order to ferment. Bubbling inside the jar and seeping brine out of the lid is normal. Check the dish about once every day. You want to keep the cabbage and the other vegetables submerged under the level of the brine. Press them down so that the gases resulted after fermentation are released. You can also taste the kimchi. When the flavor is to your liking, place the jar into the refrigerator for a couple of weeks. If you want, you can eat it straight away as well. The salt should be iodine-free and without anti-caking agents. These things may inhibit the process of fermentation. In Korea, sea salt is used when salting the vegetables in kimchi. That salt is natural and very little is done to process it. This coarse sea salt is known as gulgeun-sogeum. The reason for which you should use distilled, filtered or spring water is that chlorinated water inhibits fermentation. Depending on the Korean region or family, different seafood is used to flavor kimchi. Besides fish sauce, ingredients like oysters or salted shrimp paste may be added. Instead of only one type of seafood, such as fish sauce, you can try a mixture of two. If you want to make vegetarian kimchi, instead use just 3 tablespoons of water and optionally add a ¾ teaspoon of kelp powder. Kimchi needs around two weeks in the fridge to gain all its potential flavors. That being said, it can be eaten at any moment. The aging process will continue inside the fridge and the dish will taste great for a couple of months. After that, it will become sour, but it will still be edible. Sour kimchi is used in other dishes, as well. You can’t go wrong with kimchi as long as you make sure that the vegetables are always submerged under the brine. If at some point you see mold developing, just remove the covered parts and enjoy the rest. Kimchi appeared in Health Magazine’s top 5 world’s healthiest foods. Kimchi is high in dietary fibers and very low in calories. Kimchi has plenty of vitamins, including A, B and C.
This dish is extremely low in fat. Most Koreans eat kimchi every day, some of them alongside every other meal. Due to its low fat and caloric content, kimchi is one of the reasons Koreans manage to avoid obesity. 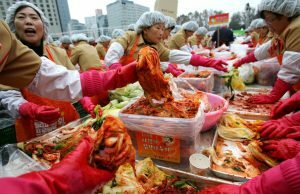 According to the Seoul National University, the cultured bacteria that can be found in kimchi helped infected chickens to recover from avian flu after it was fed to the birds.